Above structure was an actual organizational structure in one of the corporations in Malaysia. Now look at the above org structure and let it sink in.. You are only seeing 2 Groups and 3 Divisions in this org chart. Large organizations can have easily 5-8 Groups. Depending on the scale and scope of the new product, more Groups and Divisions can be involved in the day to day operations and development of a particular product. Depending on what stage the product is, there will also be periodic dealings with Legal, IT Security, Business Process, Procurement, HR as necessary. And each have their own processes and BAU (business as usual) pace. So, something that could take minutes or hours in startups, will take days and weeks, and something that could take days in startups, can potentially take weeks and even months in corporations..
As an example, let’s look at the process of adding a new feature to an existing product. Media Tech Operations Unit, after gathering full requirements from Product Manager raises a CR (change request) to IT CR Department. After the SIT/UAT is completed. Web Security team scans the website for possible security vulnerabilities. After all the security vulnerabilities are addressed, Software Development Unit deploys the new feature to Production environment. When you put it like that, it kind of sounds very reasonable. But keep in mind that these are inter-Group, inter-Division, inter-Department-wise processes. Each team that receives the CR, have their own SLAs. It can range from 1 day to 3 days just to respond with the acknowledgement that they have received the CR and will be looking into it. And that’s acceptable, as long as they respond within the SLA time period. If you want the CR to be delivered in an urgent manner, you will need to escalate to higher level bosses, these are typically HODs (Head of Departments) in the organization. Escalating to HODs can be challenging too, since you will need to have proper justifications for the escalation. Overall slowness in managing the product and responding to the market needs. CR process and “acceptable time frame” for respective teams to respond, can slow down the process even further. If CR needs certain approvals from Legal or Branding or IT Security etc, that can pretty much stall your feature into few weeks, until you get all sorted and get necessary approvals to proceed. Higher costs due to getting PIC (person in charge) for this particular product for every step of the process and organizational structure. Otherwise it will turn into “not my job” issue. 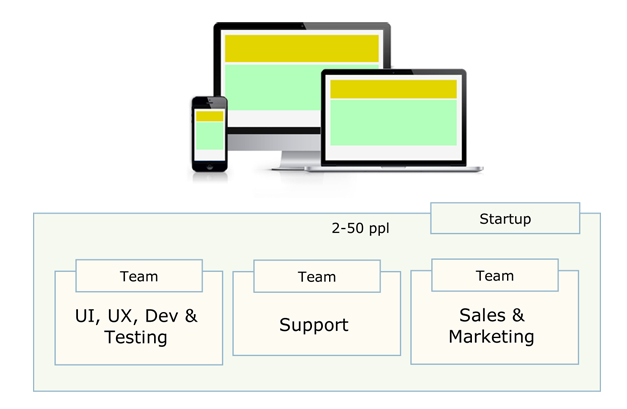 So every time you launch a new startup, you should consider Product Owner, Operations Team, Content Team. Existing teams like Marketing, Software Development, UX, Testing, IT Security need to expand their scope to cover one more extra product. Normally, within their own team, they will assign a PIC that will handle this particular product. And KPIs will be set for his/her annual performance targets. Higher costs due to “proper” infrastructure setup with all the necessary requirements that come with it: acquiring high-grade servers, engaging managed services partners, putting in place SLAs (service level agreements), considering DR (disaster recovery), compliance to various procedures and policies etc etc. This is how large organizations execute products (at least the traditional ones). There is a high chance of “new product” being assigned to the wrong person who is not really passionate about it. As a product owner, this person is the real driver of the product. However, if it’s assigned to someone who is only interested in 9-5 job and getting his salary at the end of the month.. uhmm… then this product has a high chance of failure. On top of that, above processes add up to the challenge. That means, for your product to succeed within these kind of challenges, Product Owner has to have a fire in his heart – to push through the people and processes – to get his product successful. And believe me, it’s not easy to find such people. Restructuring – big organizations get restructured fairly often. Every 6 months, there will be some kind of restructuring. This might results in change in Product Owners, Units, Departments or even Divisions. Often times these restructuring impacts the process flows that are currently in place. When that happens, it will take time until things are back to normal. That’s a pretty bleak picture I have painted above. So, how large organizations can succeed to launch new products? How can they be lean and competitive with the other smaller startups out there? That will be the topic for the next post. Please leave below your feedback regarding this topic. I would love to hear your personal experiences and opinions. ← What is the reason behind the QWERTY keyboards?